The Massachusetts softball team won both games in their doubleheader against George Washington, defeating the Colonials 4-3 in the first game and 14-1 in the second. The first game required extra innings, while the second ended after the fifth due to the mercy rule. With the two wins, UMass (20-15, 8-1 Atlantic 10) improves their conference record to 8-1 wile GW (30-13, 6-5 A-10) falls to 6-5 in Atlantic 10 play. The first game was a pitching battle, with neither offense getting much production. UMass struggled to solve GW pitcher Sierra Lange and the Colonials had equal trouble with Minutewomen starter Kiara Oliver. The Colonials pushed across two runs in the second inning and one in the fifth to go up 3-1 heading into the bottom of the fifth. In that frame, Danielle Ellis walked with two outs before Kendra Allen deposited a pitch over the left field wall for her first collegiate home run, which tied the game. After a scoreless seventh, the game went to extra innings. In the bottom of the eighth, the Minutewomen loaded the bases with one out. 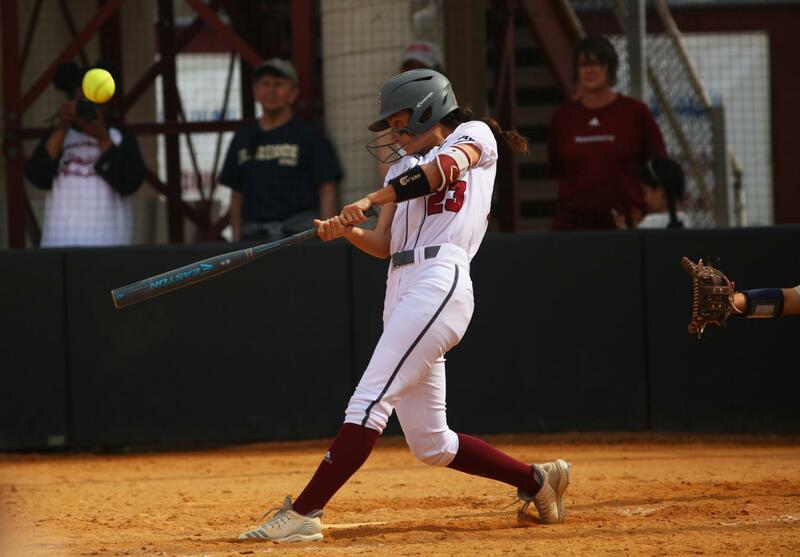 Catcher Madison Gimpl laced a single up the middle which brought Shea Newsome home and gave UMass the victory. Ellis was great the entire day, not recording an out and registering four hits and two walks. For Coach Kristi Stefanoni, this performance did not come as a surprise. During game two, UMass’ bats came alive. They scored seven runs in the first and hung a six-spot in the second to put the game out of reach. Every Minutewomen starter recorded a hit, and nine UMass runners crossed home plate. The big lead allowed senior Shea Newsome to get a rare at-bat. Riley Gregoire, who is usually used as a pinch runner for he speed, also got a chance to hit. Gimpl was just as good in game two as she was in game one. The junior recorded five RBIs in the second effort. Caroline Videtto, Melissa Garcia, and Erin Stacevicz also got in on the fun, each driving home a pair of runners. Kenadee Rausch got the ball for UMass in game two and went the distance, pitching five innings. She allowed five hits and only one run to pick up her fifth win on the season. Hannah Bunker was another bright spot for the Minutewomen. She provided excellent defense at second base in the second game, recording multiple double plays. In the first game, she went two for three with a walk and a run scored.